Last night Kobe Bryant and the Lakers visited the Knicks, for what could very well be the Black Mamba’s very last game at Madison Square Garden. On his feet was a new colorway of the Nike Kobe 10 Elite, featuring its Flyknit upper in an interesting three-toned color block with black at the heel, dark grey for the midfoot, and light grey contrasting on the toe, while purple and yellow added the accents. 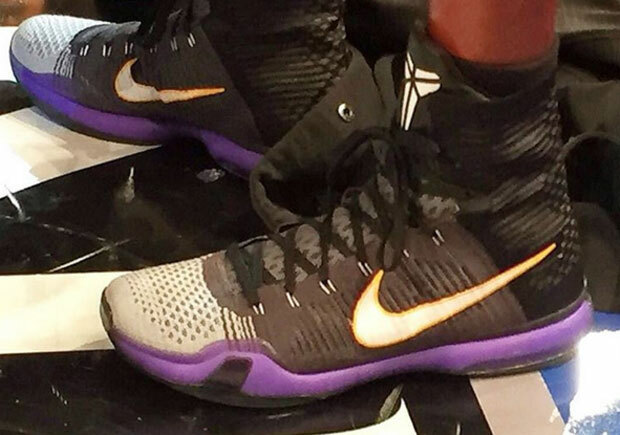 Could this be the last shoe Kobe ever plays in at the world’s most famous arena? We’ll have to wait and see if this becomes a historic pair of sneakers, or just another of Kobe’s PE colorways to file away with the rest.